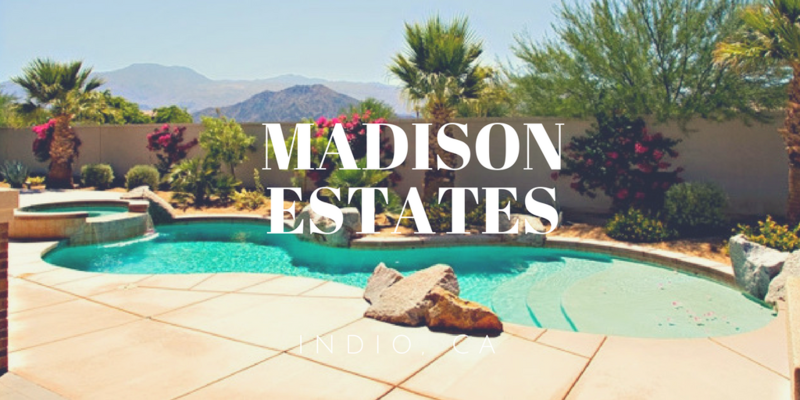 Madison Estates at Santa Rosa in Indio, CA, offers homesites on hard to find half acre lots near Palm Springs. Located off 49th and Madison Street next to the exclusive Madison Club, Madison Estates offers homeowners excellence in quality craftsmanship and picture perfect locations. 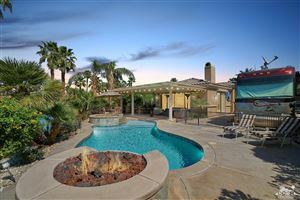 Madison Estates is located nearly minutes to La Quinta and 40 minutes to Palm Springs. Ridgeback Partners and Family Development are offering the builder's models at Madison Estates available for sale complete with designer furnishings, custom paint, built-in media niches, central audio systems throughout the house, upgraded flooring, luxurious pool and spa, landscaping, and upgraded Viking stainless steel appliances. The model homes at Madison Estates are now priced from $765,000 to $899,900 reduced from the original asking price of $1,800,000! Don't miss this opportunity to own a luxury home at Madison Estates for half the price! There are only a few models left, so don't wait another day. Upon entering the homes at Madison Estates, dramatic entry doors welcome you into a lavish interior with old-world trowel wall finish. Madison Estate homes feature sophisticated family rooms and exquisite formal dining areas. In the kitchen, the highest qualities of standards are delivered with granite slab countertops and spacious island/breakfast bars, Viking stainless steel professional appliances and Kohler stainless steel sinks. The homes at Madison Estates offer plenty of room for entertaining with the courtyard fireplace located off the formal dining area and the built-in BBQ in the backyard off the kitchen. Upon entering the backyard, family members and friends happen upon a glorious sparkling pool and spa. The master suite is a spectacular retreat. Unwind in front of the fireplace or relax in the Kohler soaking tub. The shower is big enough for two and the intimate colors are sure ways to a relaxing end of the day. In addition to the model homes, Ridgeback Partners at Madison Estates is offering a select number of homesites for sale starting from $639,900 up to $769,900. These homesites were originally slated to sell at $1,175,000 up to $1,450,000. Madison Estates is a gated community and has a low monthly homeowners association due of approximately $210. Although model homes are a dream come true, they may not be perfect for everyone. The builder at Madison Estates recognizes this and is offering the most discerning homeowners the opportunity to custom build their own home on a select number of lots starting at $199,000. With large half-acre lots, these homesites provide the perfect backdrop and location to design and build your home exactly the way you want it. Please contact me for more information or a personal tour of Madison Estates.